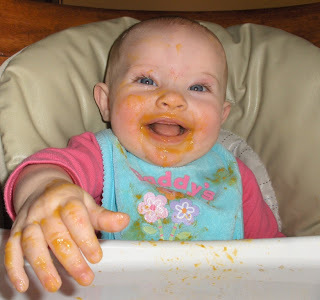 Avery has decided that her favorite food is squash. She likes it as a facial moisturizer, an eye shadow, a lipstick, mascara (which I had to remove before the photo), hand lotion, and all around fashion accessory. This is in addition to enjoying it as an afternoon snack. 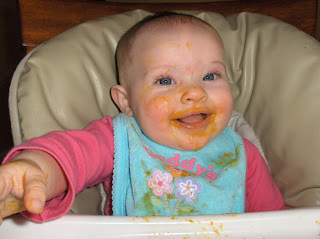 I'm not sure what got into her today, but apparently the food was more interesting all over her face than in her mouth. This is the messiest meal we have had so far. (Yes, so far) The best part was as soon as I pulled out the camera she started with these huge smiles like she knew how funny she was! Tonya! Beautiful family you've got going there...sorry we didn't get to swap Christmas cards this year. I, too, am a card giver/receiver junky. I'll get updated address info and make sure you're on the list next year. Ah. Kansas in January just doesn't beat flip-flops, does it? Oh, Precious Angel you are camera ready and that is a very good thing in this family. Like your Grams says, Just take a picture.... "243"
Thank you precious. The pictures are adorable. However, what do we expect with the great "Angel" you are working with. "243"